I like to use the Integrated Terminal Window inside Visual Studio Code, just because it’s there and it runs commands scoped to the project directory I’m in. I find it faster and more convenient than opening up another command windows or nodejs command window and then having to set the current directory to my project folder. A common issue I hit is when installing npm packages globally; I get errors trying to do it from the Integrated Terminal Window. This is because when you install npm packages globally they go into the nodesjs\node_modules directory in program files (rather than in the project folder where you are writing your code). Writing to folders under Program Files requires elevated privileges . 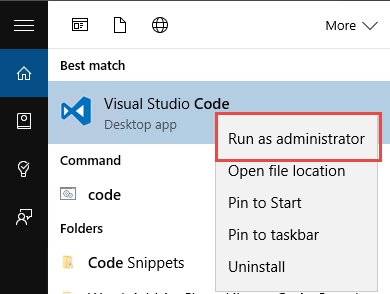 To get around this using the Integrated Terminal window in Visual Studio Code just make sure when you start Visual Studio Code that you run as an Administrator. I skipped RC6 and made the jump straight from RC5 to RC7. First step was to upgrade the versions of my dependencies (both the “dependencies” and “devDependencies”) in the package.json file. To get the magic recipe of what versions of each dependency were needed I referred back to the QuickStart guide on the Angular.io website. npm ERR! 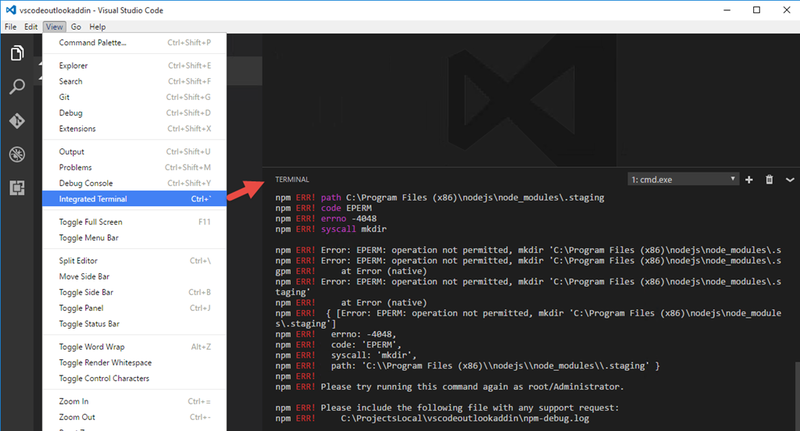 argv "c:\\Program Files (x86)\\nodejs\\node.exe" "c:\\Program Files (x86)\\nodejs\\node_modules\\npm\\bin\\npm-cli.js" "install"
npm ERR! peerinvalid The package typescript@1.8.10 does not satisfy its siblings' peerDependencies requirements! From the Angular.io documentation https://angular.io/docs/ts/latest/guide/npm-packages.html it states than you must have node 4.x.x or higher, and npm 3.x.x or higher. You can see from the error message above that I have node v4.4.3 (good) and npm v2.15.1 (bad). Running an npm install on the project now works after upgrading npm to v3.10.7. I now a warnings relating to some peer dependencies instead of the failures. npm WARN @angular/compiler-cli@0.6.1 requires a peer of typescript@^2.0.2 but none was installed.